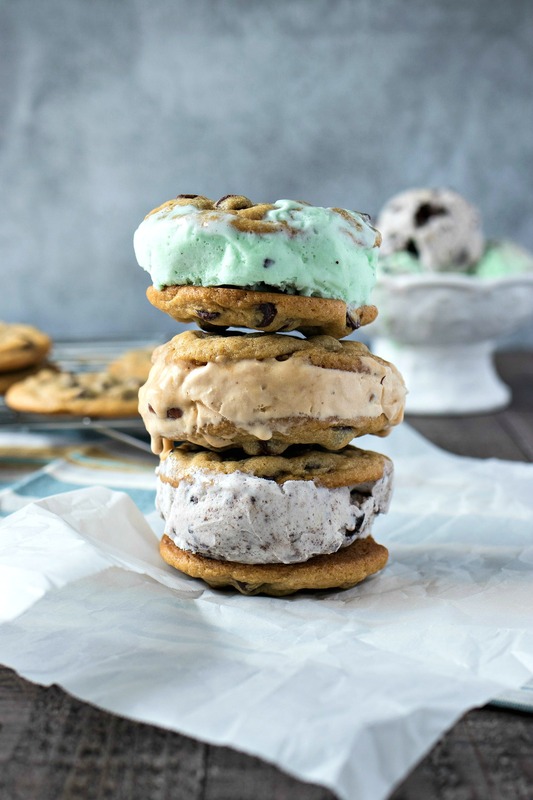 Chocolate Chip Cookie Ice Cream Sandwiches – Your favorite ice cream is sandwiched with the chewiest chocolate chip cookies to make the best handheld dessert. This is the perfect treat to enjoy all summer long and the best way to celebrate National Ice Cream month in July! Welcome to July, everyone! We’re in the peak of summer so hopefully you’ve had the chance to lounge by the pool or beach to keep cool. If not, what are you waiting for?! If you’re desperate to cool down but can’t make it to the pool or beach, you can tie up a hose so it sprays you as you lounge in your backyard. I am not ashamed to say my husband has done this multiple times this summer. Ashamed? No, he’s a genius! As I do every new month, I’ve got a new cookie recipe for you guys! But since July is National Ice Cream Month, it only felt right to convert this month’s cookie recipe into ice cream sandwiches. Oh and speaking of National Ice Cream Month, you can look forward to ice cream-inspired recipes all month long! I have about four planned already so get excited! Without further ado, let’s check out this month’s cookie recipe: Chocolate Chip Cookie Ice Cream Sandwiches! When brainstorming about what ice cream sandwich to share with you guys, I starting thinking about the ice cream sandwiches that I loved the most in the world. Over and over I kept coming back to those Toll House ice cream sandwiches. Have you had them? Super chewy chocolate chip cookies that are sandwiching vanilla ice cream and then covered in mini chocolate chips. So incredible! As cliche as that ice cream sandwich is and though there are thousands and thousands of recipes out there, I still had to share my own take on this classic, which included making the chewiest chocolate chip cookies you could ever imagine. Because there’s no worse buzzkill than biting into an ice cream sandwich whose cookie is impossible to bite through. In addition to the chewy chocolate chip cookies, I wanted to use my favorite ice cream. But it was impossible for me to pick just one because I have a favorite for each mood that I’m in. So I said “Screw it – let’s just use all three!” And that’s just what I did. The ice cream flavors I chose were: Cookies and Cream, Mint Chocolate Chip, and Caramel Pecan. See? I told you- impossible to pick just one! Which flavor(s) are you going to use??? When it comes to picking your ice cream of choice, all I suggest is (1) that you really love it and (2) that it has a soft consistency, like gelato or slow-churned ice cream. The softer the ice cream is when frozen, the easier it will be to bite into. One of the flavors I selected was really, really frozen when cold so I had to let the sandwich sit out for 5 minutes to let it thaw slightly before eating. Those were the slowest 5 minutes of my life. Before baking the cookies, make sure you’ve completely chilled the dough. This will keep the cookies from spreading too much. We don’t want thin, flimsy cookies for these ice cream sandwiches, that’s for sure. Once the cookies are baked and cooled, place them in the freezer and remove the ice cream to sit on the counter for 10 minutes. The sandwiches are much easier to assemble when the cookies are cold and the ice cream is slightly thawed. And that’s there is to it! You’re gonna love these ice cream sandwiches. Once you’re done enjoying these, make sure you come back to see what ice cream recipes I share next for #NationalIceCreamMonth! Your favorite ice cream is sandwiched with the chewiest chocolate chip cookies to make the best handheld dessert. This is the perfect treat to enjoy all summer long and the best way to celebrate National Ice Cream month in July! Add softened butter to the bowl of a stand mixer fitted with a paddle attachment. Whip butter on medium for 1 minute, until light and fluffy. Add sugars and mix together for another 2 minutes on medium. Add vanilla and egg and mix until combined. In a separate bowl, whisk flour, cornstarch, baking soda, and salt together until combined. Add to butter mixture slowly, about 1/2 cup at a time. Once all dry ingredients are add, mix for 10 seconds longer until dough is completely formed. Add chocolate chips and mix for 5 seconds. Place dough in a storage container to chill for at least 2 hours and no more than 3 days. Once dough is chilled, remove from fridge. Preheat oven to 350 degrees. Line two baking sheets with parchment paper or silicone mats. Scoop dough into 1 1/2 tablespoons and form into balls. Push down to form into a uniform disk about 3/4 inch thick. Place on baking sheet about 2 inches apart. You shouldn't have more than 12 cookies per baking sheet. Place cookies into a preheated oven and bake for 9-10 minutes until the edges are golden brown and still gooey in the center. Let them cool for 10 minutes and then transfer to cooling racks. Once the cookies are room temperature, place them in the freezer to chill for 10 minutes before assembly of the sandwiches and remove the ice cream from the freezer to soften a little. This will make it easier to handle. Rip 12 squares of plastic wrap and layer them on the counter. Grab cookies from fridge. Place one cookie of a piece of plastic wrap. Scoop 1/2 cup of ice cream and place on cookie. Top with other cookie and gently push down. Immediately cover in plastic wrap tightly and then push cookies together a little more. Place in freezer to harden for an hour or so. Repeat with other cookies until all sandwiches are formed. Sandwiches are good in the freezer for 2 weeks. Not only do they look good…the recipe must definitely taste good too. We love ice cream sandwiches…so we’ll be sure to try them!! I love baking cookies. Next time I make them, I’m going to make ice cream sandwiches! Your cookies look amazing, but add the ice cream? Wow! I always forget to chill my dough first, so thanks for the reminder! Yum! Oh my these cookies looks so delicious. I love the pictures as well. Definitely trying this one. Thank you for sharing . We totally just had ice cream sandwiches last night and you are giving me foodie flashbacks right now! YUM! Would love to be able to make some at home and do it well–bookmarking this! Aw thanks so much! Glad they inspired you to give this recipe a try! These look Amazing. Our family will definitely be trying this! You’ve totally inspired me to make ice cream sandwiches from scratch. They look way better than anything you can buy from the store! I mean, just YUM! This looks like the perfect sweet treat. Yum!! This would be so fun to do as a family…you could set out a couple different pints of ice cream and some sprinkles to dip them in and have an ice cream sandwich making party! These look absolutely incredible!! I need to give this a shot! You can never go wrong with ice cream sandwiches: two yummy treats in one! The chocolate chip cookies you made look SO good! These are not only delicious I’m sure – but beautiful too! Your chocolate chip cookies look so good!! I really appreciate the tip about chilling the dough, I had no idea it would help them from spreading so much! Thanks! These would be fun for a build your own cookie ice-cream sandwich bar! Ahh I love that idea! Wow. Just wow. These look SO delicious and are EXACTLY what I wish I was eating right now! These look so good-perfect to make with my nephews! My mouth is already watering at these! All of your desserts look amazing! If I had the time, I would be making these right now! Aw thanks! Hopefully you’ll have time to make them another day! Seriously my fave dessert ever! I am so making these asap! I don’t know why it’s never crossed my mind before to use other flavors than vanilla for an ice cream sandwich, I would love the mint chocolate chip one! Yessss! Love the mint chip! Oh goodness! I could totally go for one of these right now! Oh wow! Sorry they were so mushy for you! I will say, I cooked mine much longer than I normally do to prevent the mushy texture. You can see how the edges are super golden. So I think that will help you on your next attempt. Good luck! That looks absolutely delectable!!! I am craving some right now. Ahh genius! Sorry it turned out to be a mess. Hopefully your new plan works!